The right beard brush can really elevate your beard to the next level. It can help you look great and feel good while helping you care for your facial hair in new and different ways. We’ve done all of our research and compiled a list of the best beard brushes you can get right now. Before you start shopping, here are some things you should keep in mind while you make your choice. 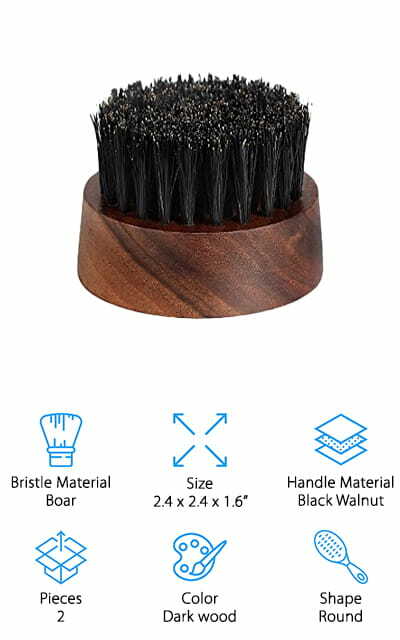 Bristle Material: The bristles on a beard brush can be made of badger hair or boar hair, or sometimes even horse hair. Most of these brushes use boar bristles to help exfoliate and soften your facial hair. Size: How big is the brush? This can help you decide if it’s the brush for you based on the size of your beard. If you have a long, full beard, you’ll naturally need a larger brush for the best effect. Handle Material: This refers to what the handle of the brush is made of. Usually, these brushes have comfortable wooden handles from a variety of different sources, from beech to pearwood. They also come in bamboo for an eco-friendly design. Pieces: When the brush comes in a kit with other accessories, we’ll let you know here how many pieces are included. Some have combs or gift boxes included, so take this into account before you make your purchase. Color: This refers mostly to the color of the handle. Most wooden handles are going to have the look and feel of wood without any staining, but some are lacquered or stained black for a more sophisticated finish. Shape: What shape is the brush? What you choose here comes down to personal preference for the most part, but some of these brushes come in rectangle shapes or oval shapes to fit more comfortably in your hand. Now we can show you the best beard brushes that we found during our research. These brushes will go a long way to grooming your beard and keeping you looking great. Take a look at our top pick and budget pick first before you start with the rest of the list. These are our personal favorites. These are all top beard brushes, and we’re sure that you’re going to find your perfect new tool! Kingston makes the best boar’s hair beard brush on our list. It has a nice, comfortable oval shape so that it fits well in your hand. The handle is made of a beautiful, naturally-colored Beechwood that’s going to look great with the rest of your beard accessories. All of the bristles here are natural, with no fillers or nylon substitutes. They are heavily reinforced so they stay exactly where they are meant to stay. You can use it in your hair or in your beard for great results! It comes with a travel-friendly box that you can use to take your brush with you without ruining any of the bristles. This brush has a medium-to-soft stiffness, so it’s the perfect density for grooming even the fullest of beards! It helps to redistribute natural oils throughout your hair, maintaining a polished and healthy look no matter how much hair you need to brush. It’s a perfect size, too! What is the best beard brush for use with oil? The choice is ultimately yours, but you should definitely consider Viking Revolution’s beard brush. 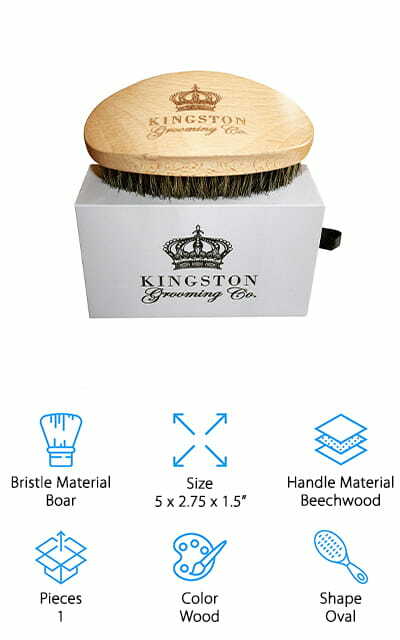 It’s a good-sized brush that is made from the highest quality boar bristles, with a handle of bamboo and pear wood. The rectangle shape is perfect for longer beards or for use as a hairbrush. It still fits comfortably in your hand and gives you excellent control over where the brush goes. It works well as a gift for the beard enthusiast in your life, no matter the occasion! You can use it with oil, pomade, balms, and even conditioners to make sure that they are distributed evenly throughout your facial hair. All of the woods are natural and high-quality, and it retains a natural wood color that looks and feels great. Keep the tangles out of your beard with this amazing brush, and check out their other products for more accessories. The Rapid Beard brush set comes with two separate pieces, including a natural wood comb and the best boar bristle beard brush we could find in a set! The brush and comb work well in any type of hair, from short hair to long, thick hair and even the coarsest of beards! All of the natural boar bristles in this brush will help to distribute oils and other balms, including waxes and conditioners, across the surface of your beard for better coverage. It can help to smooth your beard and soften the texture down to something amazing and manageable. All of the combs and brushes that come with this set are handmade and made so that they don’t snag or pull on your beard. Plus, the comb keeps dandruff away when using regularly. When it comes to men’s beard brush kits, this is definitely one of the best that we found during our extensive research. ZilberHaar’s Beard Brush is perfect for getting the well-kept, soft beard that you want. All of the bristles on this pear wood handle are completely natural and pure, selected for the perfect stiffness to make even the thickest of beards neat and smooth. This beard brush has a great grip on your beard and will help to distribute oils throughout, making your beard smoother and healthier overall. It’s a great gift for the bearded man in your life, even if they’ve never tried a beard brush before. They’re going to wonder how they ever lived without it. Plus, using a beard brush can help reduce itching and cut down on the number of ingrown hairs that you get due to the way the boar beard brush spreads oils around in your beard. With a lifetime guarantee and high-quality materials, we’re sure that you’ll be happy with your beard brush. If you aren’t, you can get a complete refund. 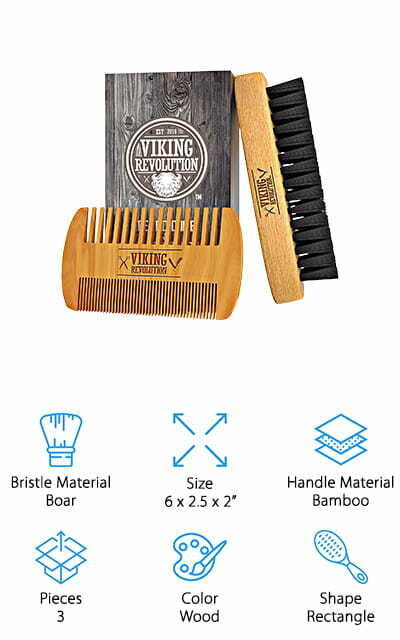 Striking Viking makes this amazing beard grooming kit, which includes a boar’s hair beard brush, a dual-sided comb, and a carrying case to keep it all together. 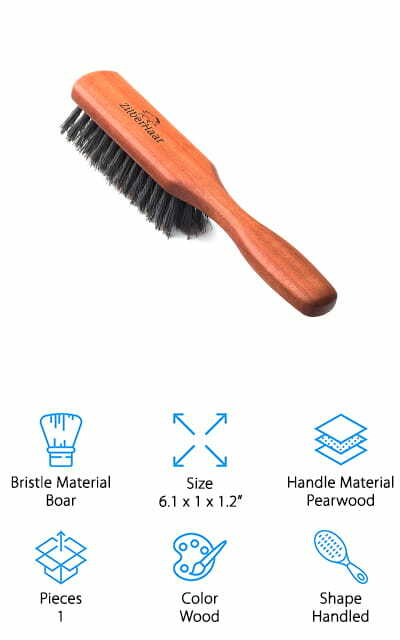 The comb and handle of the brush are made of sandalwood, a comfortable wood that doesn’t allow static electricity to build up. This means that your beard will stay smooth and frizz-free while you’re doing all of your stylish and brushing. The dual-sided comb has fine bristles on one side and coarse teeth on the other for brushing through your beard easily no matter what texture it takes on. We love that you have the option of both types of brushes. Even the most tangled and unmanageable beards will benefit from the use of the tools in this kit. We love that it has a carrying case so you can take this top-rated beard brush on the road without ruining it! We know that you’re going to love this unique brush kit. This brush by Hundred Beard Co is one of the best beard brushes for short beards because of the size, as well as the shape of the handle. Whether you need a brush to keep the rogue hairs on your stubble in line or a full kit for taming your long beard, this brush is going to be perfect for you. It’s a great beard oil brush that can apply your favorite balms and oils without causing any undue mess. It’s a great gift for the beard-owner in your life, to help make their grooming routines that much better! Plus, the wooden handles are lacquered in black to give them a sophisticated touch that will look amazing on your sink or vanity. This may be a simple brush, but it’s effective and absolutely beautiful to look at. 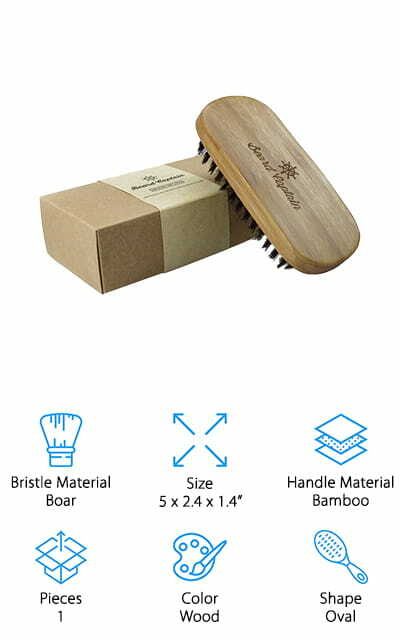 Not to mention that all of the bristles are 100% natural boar bristles. You deserve the best, and your beard does too! Beard Captain’s boar bristle beard brush is made with the highest-quality materials, from the bamboo handle to the boar bristles. It’s got a convenient, oval-shaped design that will fit right in the palm of your hand so that you can control where the brush is going accurately. The handle is eco-friendly, and it boasts that classic, original look and feels that you expect from a beard brush. It comes with a travel bag, complete with drawstrings so that it’s easier to carry with you when you travel. That way, the brush doesn’t get crushed or ruined in the rest of your luggage. It’s great for shaping your facial hair and getting all of those errant hairs under control, and you can even use it to spread beard balm, oils, and wax. It even comes with a gift box so that you can present it to the bearded man in your life for whatever special occasion you prefer! 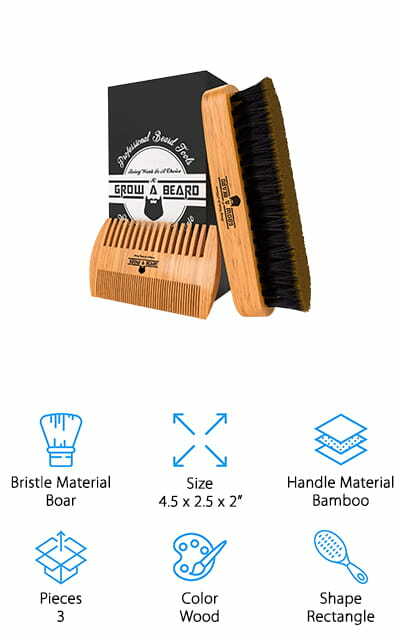 This beard brush kit by Grow A Beard will keep you looking and feeling great. 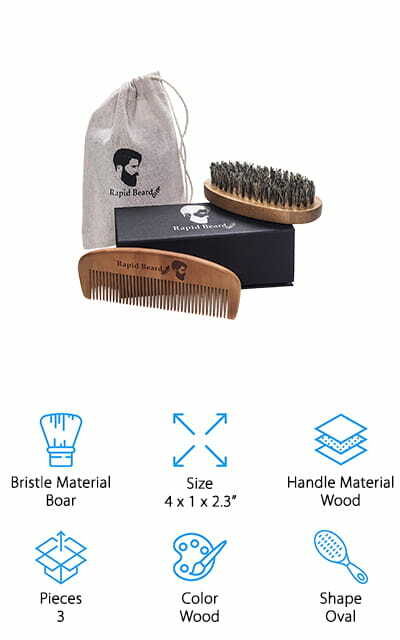 This soft beard brush and comb set will keep your beard looking smooth and keep it shiny so that you always feel your best. 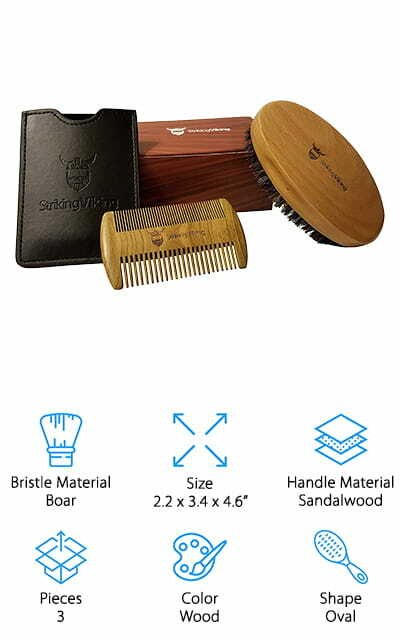 The comb in this set is made of bamboo, great for keeping the skin under your beard looking and feeling great as well. It can help to eliminate dandruff, keep ingrown hairs down, and help to stimulate the natural production of oils to keep your beard healthy. It comes in a great gift package so that you can present it to the bearded man in your life for any special occasion. The bristles are 100% boar, stiff enough to allow you to exfoliate your skin and also keep all of your errant beard hairs under control. Both the brush and the comb will last you forever, even when you use it with particularly thick beards and other facial hair. The Rugged Bros makes one of the best boar bristle beard brushes we found during our research. Instead of being a flat brush that you have to move to get complete contact with your face, this brush is curved on the top and over the bristles. This allows it closer contact to your face and a natural fit in your palm so that you can easily and effectively style and shape your facial hair. 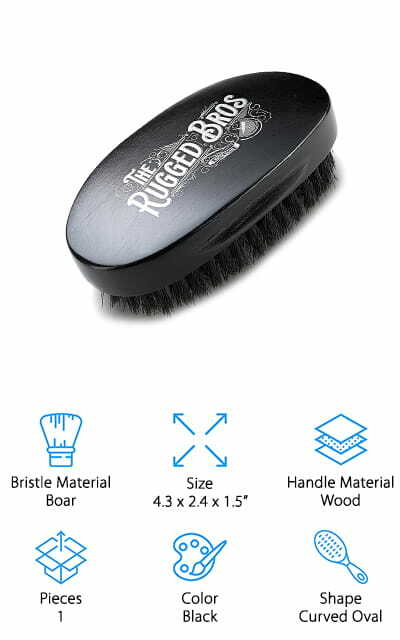 The bristles are 100% wild boar, combining long and short hairs for maximum contact with all parts of your beard. It has a strong grip to help straighten your beard hairs. It’s a great gift, with natural wood handles and a beautiful finish. It’s one of the fanciest brushes we could find, and we’re sure that you’re going to love it. They use no nylon or plastic bristles, either – all of the bristles are naturally-sourced for the perfect beard brush. Your mustache will be happy, too. BFWood makes the last amazing beard brush on our list. It’s made with softer bristles so that it never scratches your face, only exfoliates gently and completely for the best in beard and skin care. It’s a small enough brush that you can take it with you while you’re traveling and it won’t take up much room. The handle is made of handsome black walnut that will look beautiful on your vanity. 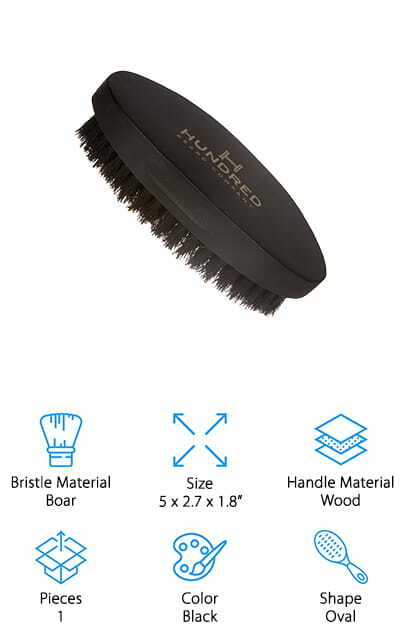 Combined with the look of the natural boar bristles, this is a brush that you can’t pass up if you are looking for a new one. The ergonomic round shape will even help you distribute beard balm or wax, keeping your beard looking great and in the perfect shape that you want without any additional hassle. We love everything about this small, compact brush. It’s great for beards of any size, especially shorter ones or if you’re just starting a new amazing beard growth.